1 Senecio Radicans 'String of Fish Hooks' 6"
Wow, this is a great gift for Mom, a new purse and a string of pearls! It's fun, in vogue, and the 'flowers' won't die in 3 days. You can't beat that. 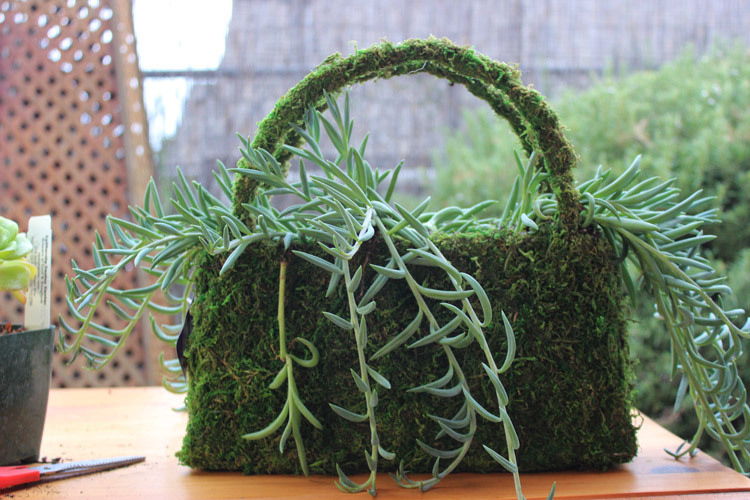 The purse is made of wire and moss, and has a plastic liner. You can find them on line, or at a garden center. I found mine at Armstrong Garden Center. The cost was reasonable, about $12.99. 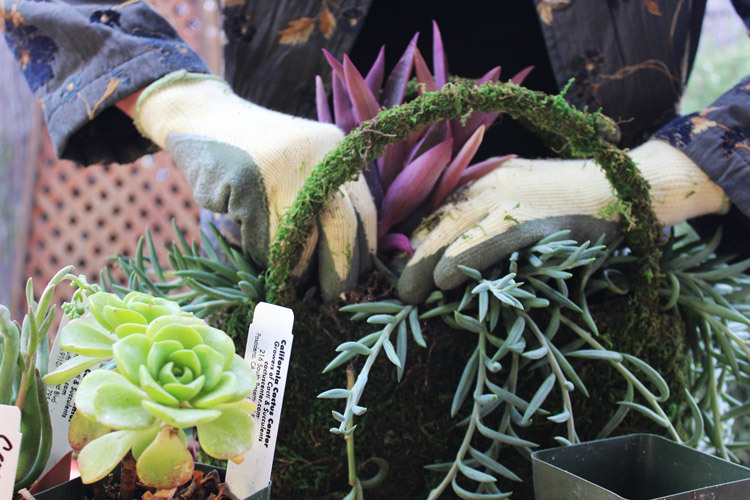 The succulents can be found at a flower mart, a cactus center, your local garden center, or even at a hardware store or other big box retailer. Look around. You may not find everything you want at one stop. Buy what you like and keep looking. Some garden centers will order what you want if you can wait a day or two. I bought my 'String of Fish Hooks' succulent at Armstrong's and they ordered my 'String of Pearls' and had them the next morning. If you are in Los Angeles, you will want to make a stop at The Cactus Center in Pasadena. They have an incredible variety of succulents including many rare ones. 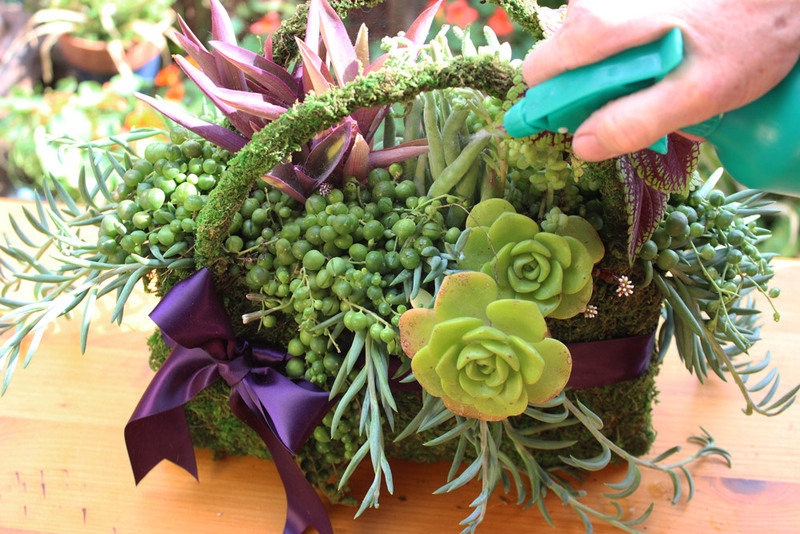 Select some different shades of green, and in this arrangement, there are shades of purple too. Select different heights, and textures. 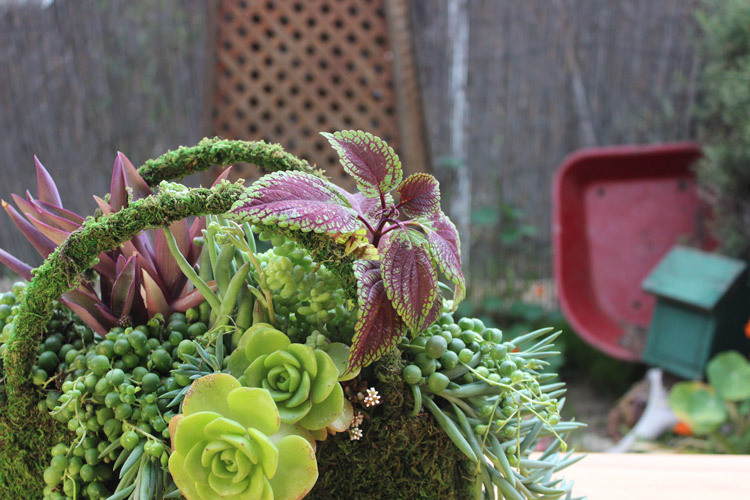 The coleus (the red and green plant on the right) is not a succulent, but its colors worked perfectly with the greens and purples in this arrangement. 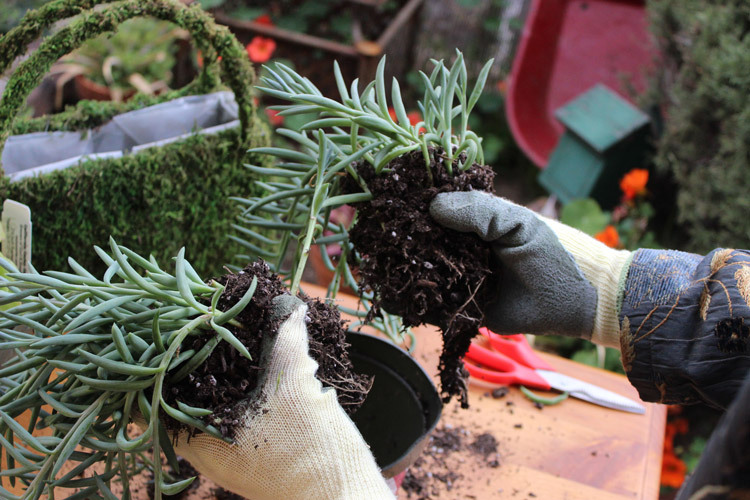 Tap or hit the sides of the plastic containers to loosen the dirt from the sides, so you can easily remove the plant. Hold the plant at its base, and handle with care, as the leaves are delicate and will come off or break easily. 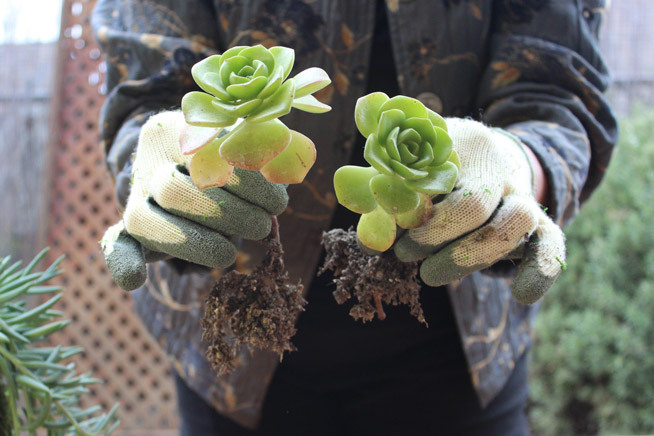 At some point in planting, you may want to take off your gloves, (Hey this is serious) since you will be working in such a tight space, and you will be able to guide the plant into its spot with more ease without breaking its leaves. But don't worry, you probably will break a few. It's OK. Wait a few days before watering. 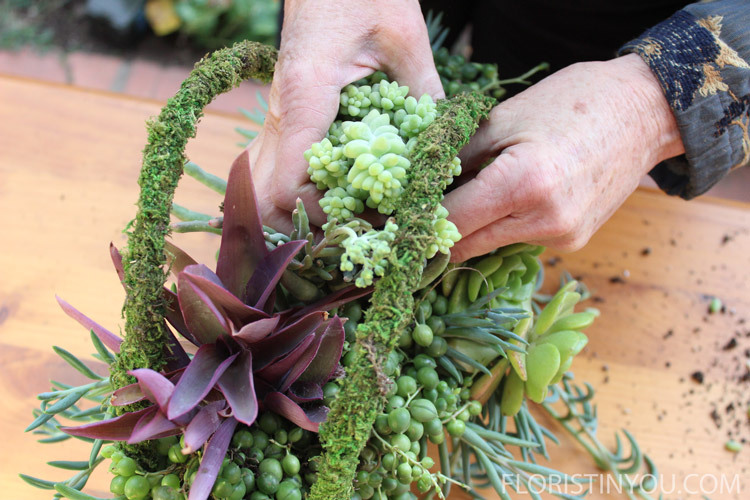 Then water your succulents about once a week, but don't over water. 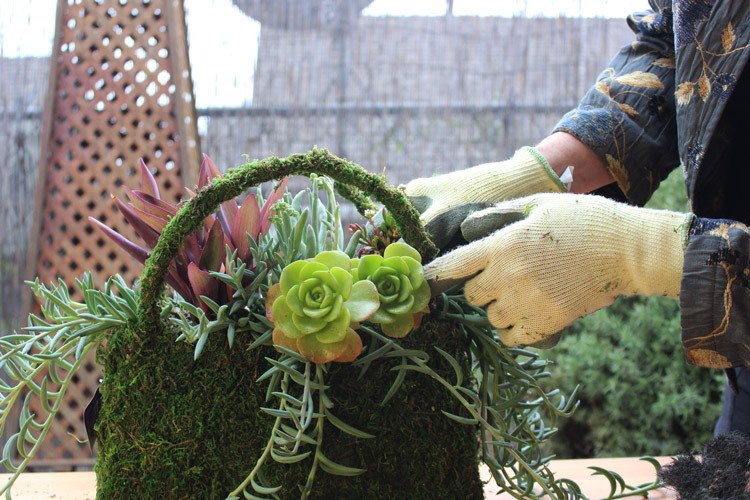 Normally you want a drain in the pot for succulents, so because this purse has a plastic liner, check that the soil is dry before watering. If you are in a cold climate, in the winter time, they may only need misting twice a week with a spray bottle, or watering once a month. All right, lets get to work, so Mom can have a new purse and a string of pearls. Here are the succulents and materials you will use. 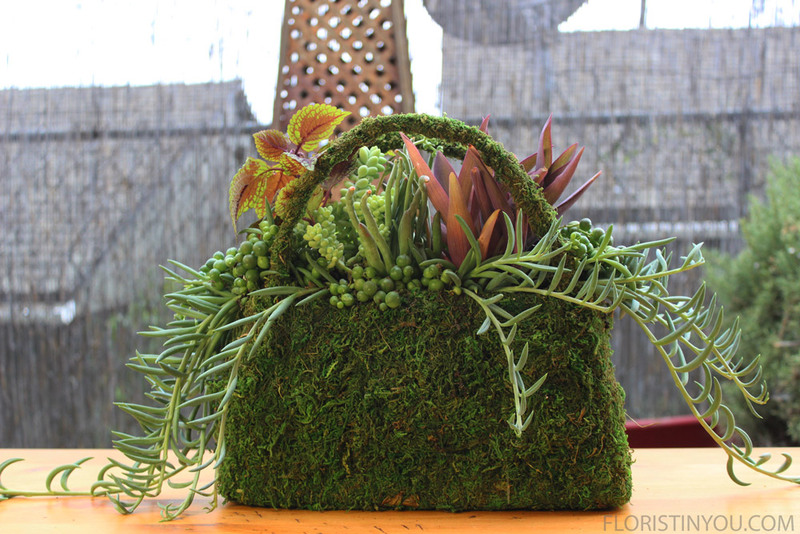 Select a moss purse with a plastic liner. Select cactus potting mix. The pumice helps roots. Pour in to 2.5 inched below top of purse. Divide into 1 large, and 2 medium sections. Put medium section on each side. The largest section goes in the front. Loosen root ball, and get rid of extra dirt. Plant on left very close to 'Fishhooks'. Loosen roots. Plant 'Fingertips' next to 'Purple Heart'. Loosen root ball and remove excess dirt. Plant large saucer at outward angle, near middle. Place smaller saucer next to larger one. Plant Crassula Radicans around and to right of saucers. Divide pearls.1 large, 2 med, 1 small. Loosen roots. Plant med. on both sides. Loosen roots on 'Donkeytail'. Loosen extra dirt. Plant coleus on far right. Measure approximate length for bow. 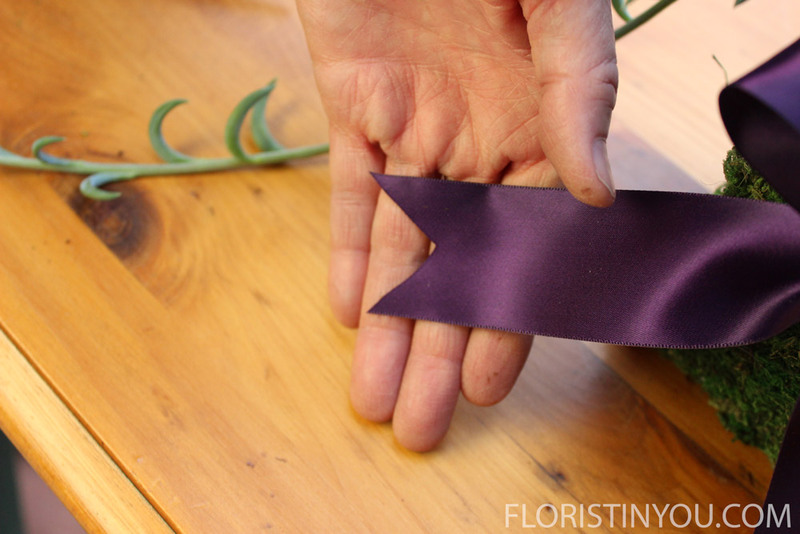 Fold ends in half and cut ribbon at 45 degree angle. Oh, you like the bow there, Buddy? Yes? Good! After 2-3 days water. Water about once a week. In a cold climate in winter, mist them twice a week instead, or water 1 month.